Deep Wave Hair Extensions Weft. Remy Hair Grade, Top Hair Grade. 1 Piece / Bag. Neutral Packing. 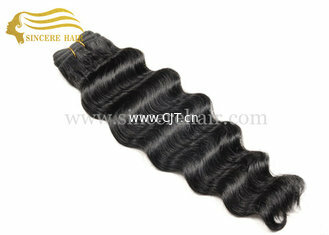 Hair Tpye Wave Hair Extensions Weft. Remy Human Hair Weft Extensions. Deep Wave. Silk Straight Wave, Body Wave, Natrual Wave, Water Wave, Yaki, Curly, Deep Curl available. Hair Texture could be customized. Hair Weight 100 Gram each Piece. Hair Weight could be customized. Name: Wave U-Tip Hair Extensions, Pre Bonded U Tip Hair Extension.